All set for TIGA 2012! We’re all totally pumped to have a good time at the TIGA 2012 awards. What’s super cool about it is that it will be the first time the team has actually met in person since the project started back in March. Barry Island and Charlie haven’t seen each other for the best part of six years! We’ve also never been to anything like an awards ceremony. It’s gonna be a totally awesome reunion and party for us. We’ve also got ChetMega from Townhouse Records and his entourage coming along to enjoy the event along with some other VIP guests who’ve supported Frutorious all the way from the beginning. Look at our awesome t-shirts! Previous postNo way! 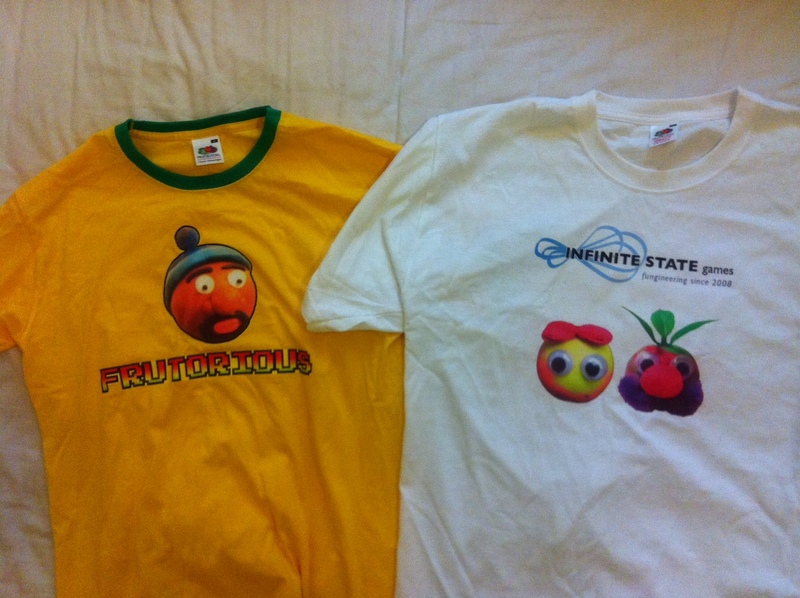 Frutorious is TIGA 2012 nominated! Next postFrutorious FREE till 5th November to celebrate TIGA 2012 awards!